Home » Golf Tips & Instruction » FAQ » The Curious Case of Shanks: What is a Shank in Golf? Ever hear the dreaded ‘Ping’ during a golf shot and watch your golf ball fly off to a random direction? You’ve been introduced to the despicable Shank in golf. Just like the Yips, shanks are a terrible malady that most golfers speak of in hushed tones. It can quickly become the career-killer if you don’t get rid of such a habit. A. What is a Shank in Golf? B. What causes the Shanks? C. How is shank different from a slice? The ideal golf shot would involve a graceful but power-boosted swing that comes down with the ball impacting the clubface exactly at its sweet spot. But it’s nigh impossible to hit the sweet spot every time. The ball impact tends to wander causing a mishit. The shank is the worst (and probably the most embarrassing) case of a mishit. A shank is a case where the ball hits the hosel or heel of the golf club and careens off wildly usually to the right side of a right-handed golfer. The hosel is the cylindrical part of the clubface that attaches to the club handle. The heel is the clubface area close to the hosel. The surface of hosel that might make contact with the golf ball during a shank has the rounded nature that launches the ball in any direction based on where the ball touches the hosel. Check where you stand with respect to the ball. Standing too close to the golf ball can get you shanked. When you stand too close, your spine will become more vertical during the downswing and the impact. This makes the clubhead move farther from your body and causes the hosel to stick out at impact. If you are too far from the golf ball, you will compromise by leaning toward the ball and end it in a shank. Use this drill to avoid the chance of shanks in golf. Part of the Swing path is controlled by our minds and part of it by the instinct of the body. To make the golf club do our bidding, we must gain control over our instincts. For hitting a shot straight, we often tend to take a slightly in-to-out curve compared to the target line. But the mind quickly registers the mistake and tries to compensate with an out-to-in swing in the downswing. The result of the fidgeting is that the clubface moves out and away from the target line and the hosel is the first item to hit the ball. A shank in golf ensues with a dramatic laughter from the audience. 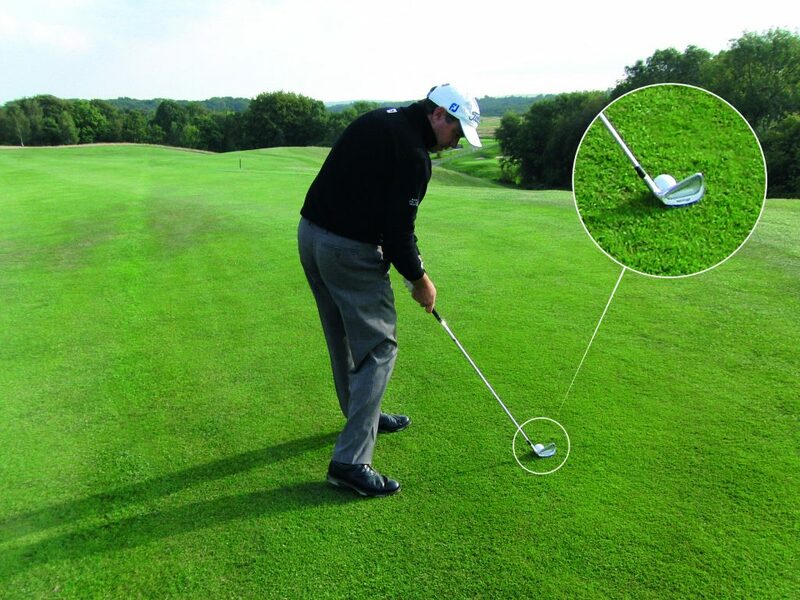 ​We go into some detailed drills on how to fix this issue in our post on how to cure a shank in Golf. In our post on how to stop hooking in golf, we advocated against a very strong grip. Here we ask you to have a neutral grip again. A weak grip might cause the golf club to rotate in your hands as it comes down. The golf ball may hit the hosel and can cause a shank in this case. This picture shows you how 3-4 knuckles of the right hand are visible in the weak grip compared to 1(or less than one) knuckle on the left hand. When you look down at a neutral grip, you can see only 1.5-2 knuckles of the right hand. This prevents the movement of the club within the grip and hence the shank. In the effort to hit the ball in the downswing, maybe the golfer leans forwards by channeling his weight to his toes. Or she/he compensates for the elevation of the spine during the swing by leaning forward during impact. You can notice this if you feel too much weight on your toes in the downswing. This causes the clubface to move away from the target line and the ball hits the hosel. And it’s a shank again. The trick again is to maintain a constant spine angle and head level at every step of the golf swing. Some people prefer to close their clubface at the top of the swing and then open the clubface in the downswing. If you are lucky and a good player, this shot works out well. But if you open the clubface too much, the ball will likely hit the hosel, resulting in a shank. A shank usually sends the ball flying to the right. So it’s easy to misjudge it as a slice. Except during a slice, the ball is still making contact with some part of the clubface. During a shank, the ball is way off the mark and hits the hosel. A shank is a more severe case. If it’s repeated, it should be more urgently dealt with. We also explain how to fix a golf slice here. A shank can be a rare event in your golfing journey. But when it hits your game consistently, it can wreak havoc. We tried to find what ticks the shank and allows it to creep into our gameplay. This is a quest to understand where you could be going wrong. In a more detailed post, we discuss how to fix the deadly shank. The onus of rising above the shank lies with the golfer, the coach can only teach.